Want to have a great program in your school? 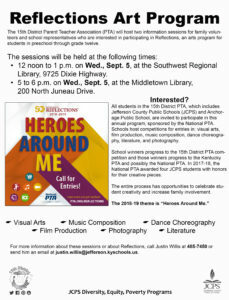 Have the National PTA Art Reflections Program. It is a program designed to enrich the students in the areas of visual art, music, photography, literature, film/video production, and dance choreography. Official Paperwork has not be distributed to PTA as of today. When it becomes available we will put all the files here for download. One entry per grade in each category (i.e., music, photography, visual arts, literature, dance choreography and film/video production). Example: A PTA can enter one entry in third grade, fourth grade, and fifth grade (which is an Intermediate category) in the category of Music. They can also enter one entry in preschool, kindergarten, first grade and second grade (which is a Primary category) in music and so forth. Packets of information and forms will be sent out to all PTAs, Principals, Art Teachers, Reflections Chairmen, FRYSC Coordinators, Music Teachers, English Teachers, Technology Teachers, and Dance/P.E. Teachers during August. 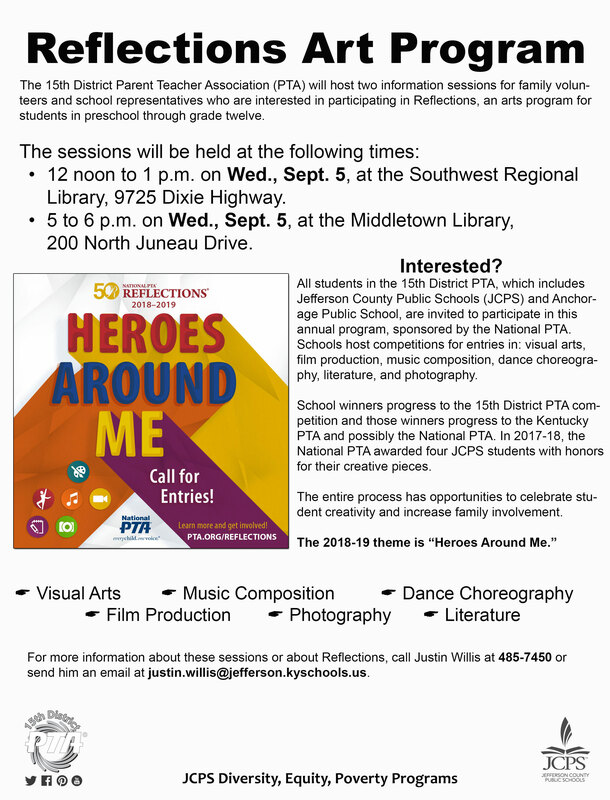 Make the Reflections program a part of your PTA program. For more information, call Autumn Neagle at (502) 718-2590 or email her at 15thDistrictPTA.President@gmail.com. We are doing a Reflections Workshop – Please join us.